Harlequins will make history on Saturday when they face Leicester at Twickenham in front of 50,000 fans. The match sold out on Monday and will be a Guinness Premiership record attendance for a regular season game. 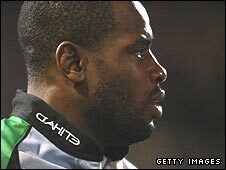 Harlequins and England wing Ugo Monye told BBC London 94.9: "It's another huge occasion, something the guys have absolutely thrived on in recent weeks." The London side are in form having recently beaten French club Stade Francais twice in the European Cup. A last-gasp drop-goal from Nick Evans secured a second dramatic Heineken Cup victory for Harlequins against Stade Francais two weeks ago. The first match was just as tense, played in front of 76,000 fans at the Stade de France. Quins form dipped last week however, when they lost in the Premiership away at Northampton. Monye said: "The guys have been flying high for such a long time and we haven't really suffered defeat for a while. "But you cant get too down on yourselves, of course we want to win every single game we're involved in. "But it's back to square one and we're excited and looking forward to a big game against Leicester." Since Harlequins were promoted back into the Premiership in 2005 they have not beaten Leicester in the league, a statistic Monye hopes to change. "Leicester are a quality side in the Guinness Premiership and we've played them not too long ago and they beat us up at Welford Road," he said. "But we're hoping we can turn that around this weekend." At the relatively young age of 25, Monye is one of the oldest players in the Harlequins squad, something he is learning to enjoy. "I think at one point this season I was the fourth oldest guy on the team," he said. "Although I'm a veteran, its great, it's so good to be part of a really young side." Monye was selected for England in the Autumn internationals and said it was something he had always wanted as a player. "Obviously it was great to be involved, it's always been a dream of mine and to actually finally achieve that has been fantastic," he added. "I've got a lot to work on, but if you'd have given me this at the start of the season - to say I'd have four caps, Quins will be a few points off the top of the table and top of our Heineken Cup pool and I was going to be a part of that, I would certainly have taken it."